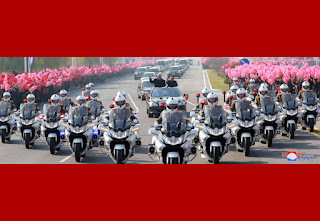 Present there were Kim Yong Nam, member of the Presidium of the Political Bureau of the Central Committee of the WPK and president of the Presidium of the Supreme People's Assembly of the DPRK, Choe Ryong Hae, member of the Presidium of the Political Bureau of the WPK Central Committee, vice-chairman of the State Affairs Commission of the DPRK and vice-chairman of the WPK Central Committee, Premier Pak Pong Ju, member of the Presidium of the Political Bureau of the WPK Central Committee and vice-chairman of the State Affairs Commission of the DPRK, Ri Su Yong and Pak Thae Song, members of the Political Bureau and vice-chairmen of the WPK Central Committee, Ri Yong Ho, member of the Political Bureau of the WPK Central Committee and foreign minister, Kim Nung O, alternate member of the Political Bureau of the WPK Central Committee and chairman of the Pyongyang City Committee of the WPK, Ri Ryong Nam, vice-premier of the Cabinet, and Ma Chol Su, DPRK ambassador to Cuba. 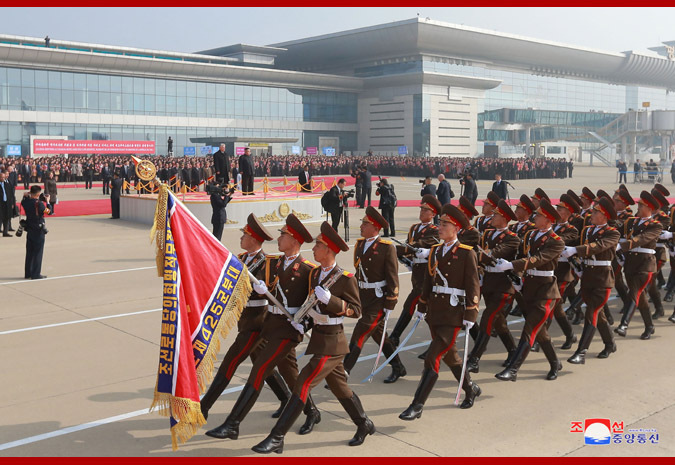 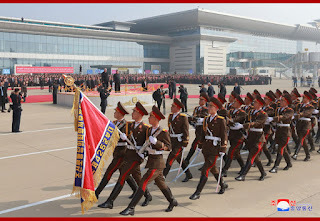 Army General Kim Su Gil, director of the General Political Bureau of the Korean People's Army, Army General Ri Yong Gil, chief of the KPA General Staff, Army General No Kwang Chol, minister of the People's Armed Forces, and other commanding officers of the KPA were also present there. 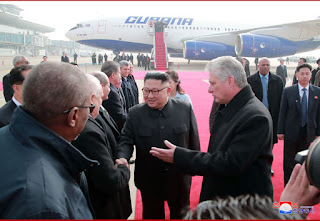 Ambassador Jesus De Los Angeles Aise Sotolongo and staff members of the Cuban embassy here were on hand. 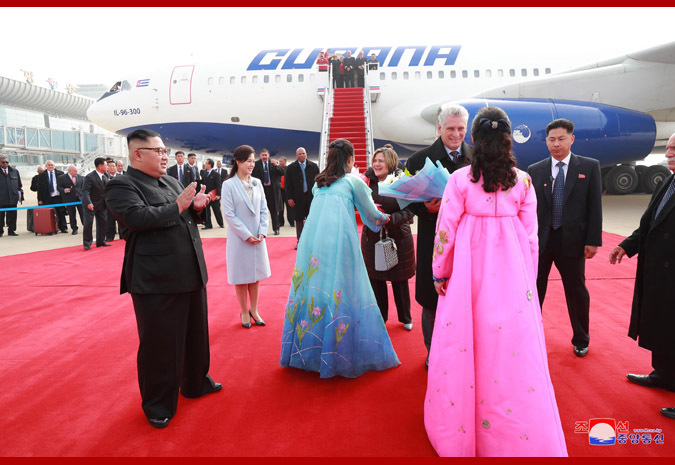 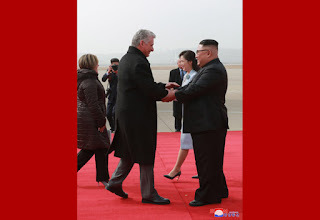 Kim Jong Un and his wife Ri Sol Ju warmly greeted Miguel Mario Diaz-Canel Bermudez and his wife Lis Cuesta Perasa. 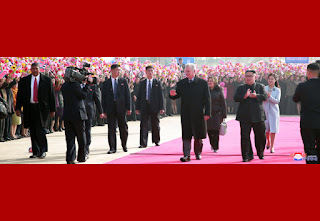 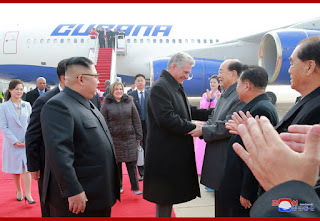 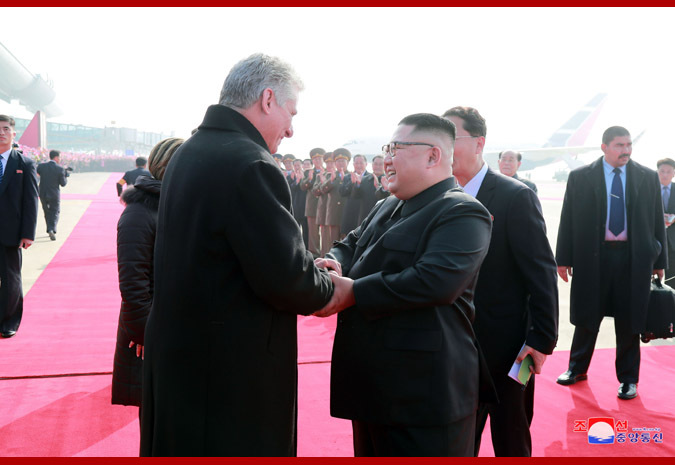 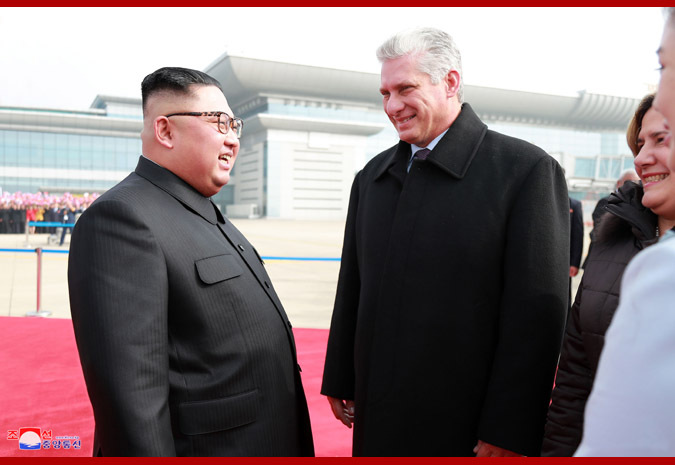 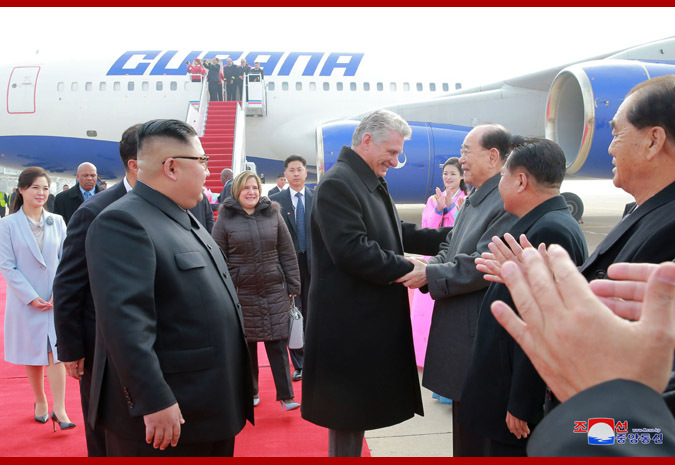 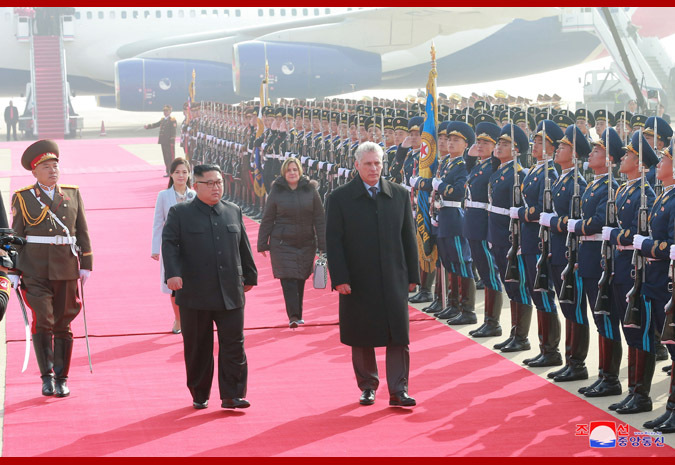 Kim Jong Un introduced to Miguel Mario Diaz-Canel Bermudez the leading officials of the Party and the government and the commanding officers of the KPA who came to greet him. 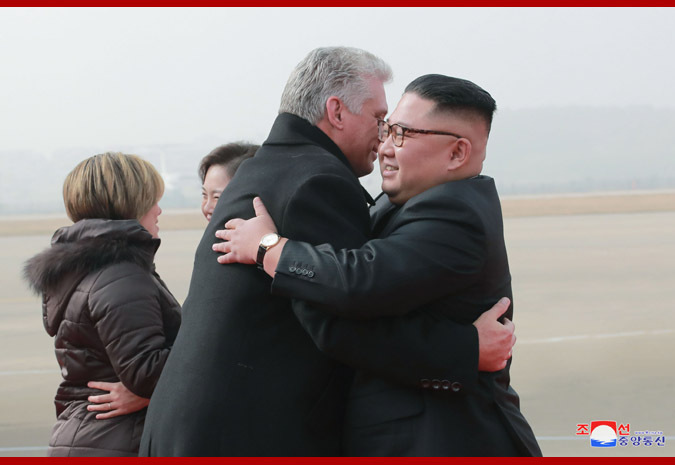 Kim Jong Un exchanged greetings with his entourage. 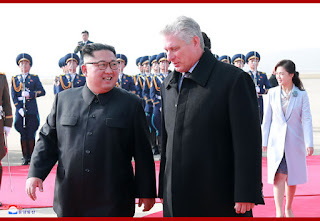 There was a ceremony for welcoming Miguel Mario Diaz-Canel Bermudez, president of the Council of State and president of the Council of Ministers of the Republic of Cuba. 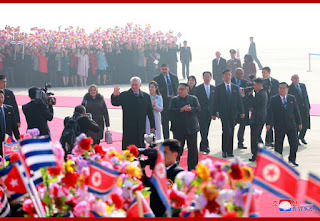 Amid the playing of the national anthem of the Republic of Cuba and the patriotic song of the DPRK, a 21-gun salute boomed. 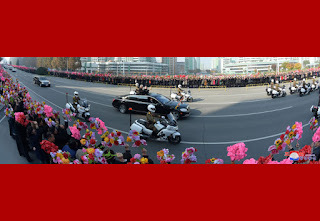 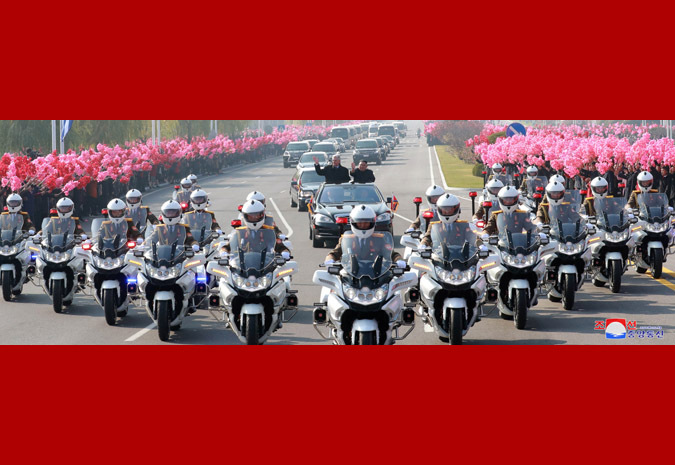 Miguel Mario Diaz-Canel Bermudez, together with Kim Jong Un, reviewed the guards of honor of the KPA. 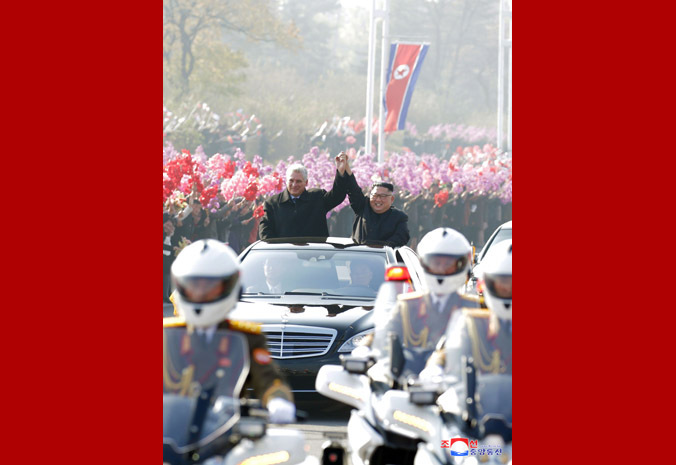 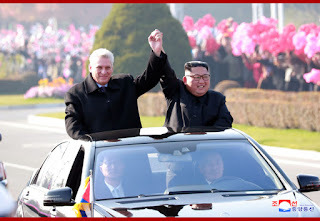 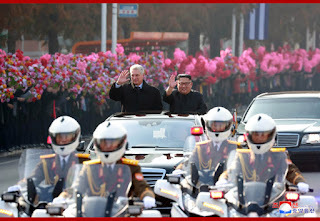 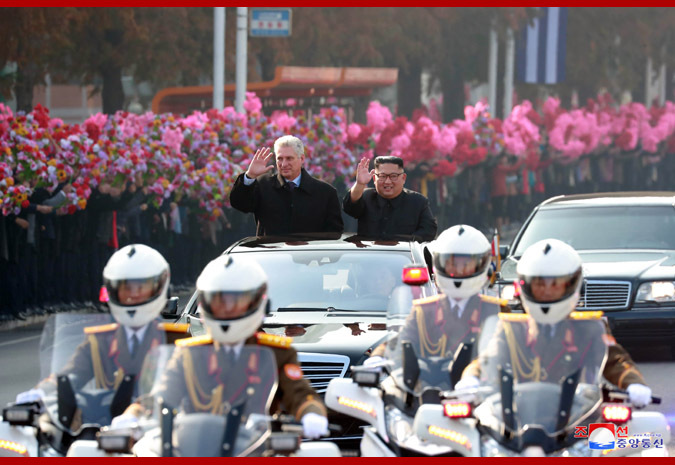 Miguel Mario Diaz-Canel Bermudez, together with Kim Jong Un, waved back to the enthusiastically cheering citizens. 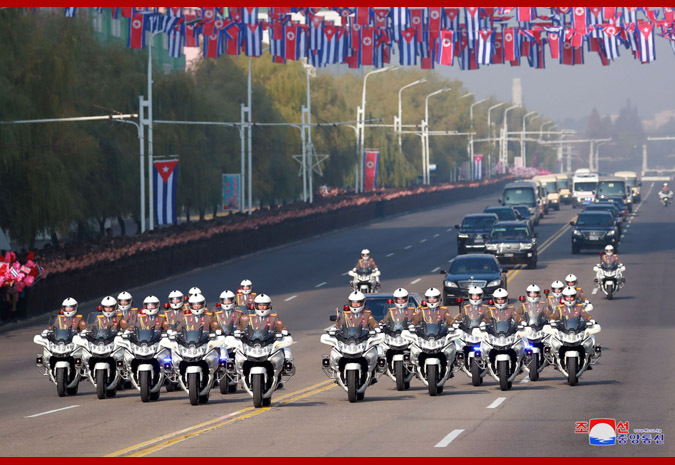 The car carrying Miguel Mario Diaz-Canel Bermudez headed for the lodging quarters, escorted by motorcycles. 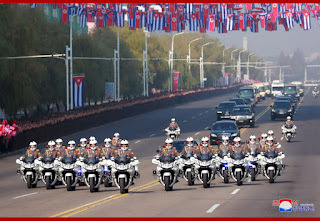 Streets in the capital city where cars carrying the missions of the revolutionary Cuban people passed were crowded with welcoming citizens, school youths and children and service personnel, and welcoming people could also be seen at the windows of flats. The car carrying the top leaders of the two countries arrived at the Paekhwawon State Guest House. Kim Jong Un and his wife Ri Sol Ju personally guided the Cuban president and his wife into a room of the lodging place.